How has it been since August that this blog has featured a dessert recipe? I’ll be honest, the gap in blogging about desserts is certainly not for lack of eating them! Halloween and our Stranger Things Party made sure of that. But now that Thanksgiving is upon us, leading (obviously) straight into the Christmas season, I say we can interrupt our regularly scheduled mostly healthy programming to bring you these Apple Pie Truffles. 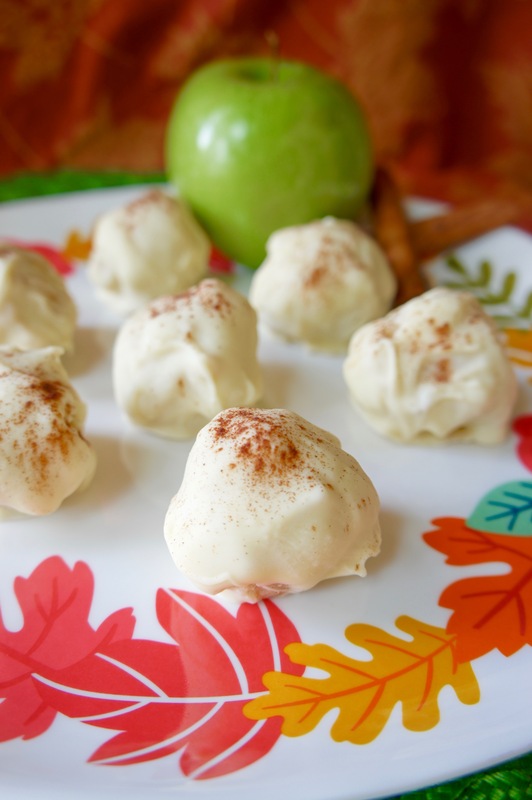 Why Apple Pie Truffles? Doesn’t regular pie stand on its own as the top choice of discriminating holiday dessert eaters everywhere? Why would you mess with greatness? Well, pie and truffles are like religion and science: they don’t have to be in opposition! There’s room at the table–literally–for both. These decadent truffles are like individual apple pies in poppable bite form–oh, and did I mention they’re covered in white chocolate? Apple pie + white chocolate is the flavor combination you didn’t know was missing from your life. The use of shortbread cookies to achieve the buttery texture of crust adds to the sensory experience…and of course the taste. I’m thinking these need to make an appearance at our annual Christmas party…and maybe at a cookie exchange…and heck, let’s throw in Thanksgiving dinner, too. I don’t think anyone will mind. 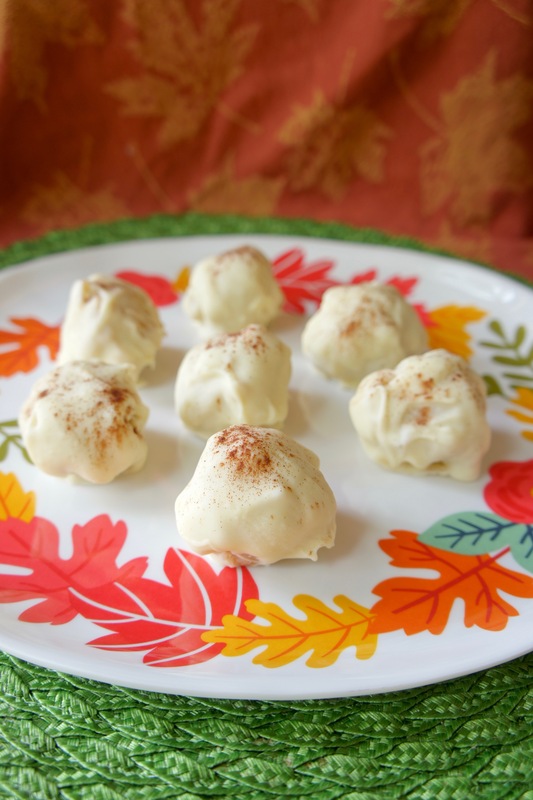 These decadent truffles are like apple pie in poppable bite form! Peel apple and dice fine into ~ 1/4 square cubes. Place in a small saucepan with 1-2 Tbsp. of water, cover, and heat over medium heat about 5 minutes or until apple has just softened. Remove from heat, drain if any water remains, and set aside to cool. Crush shortbread cookies into crumbs. In a large mixing bowl, combine cookie crumbs, powdered sugar, cream cheese, 1/2 tsp. cinnamon, and melted white chocolate. Form into a ball as best you can, cover, and refrigerate for 1 hour. Line a flat platter or baking sheet with wax paper. Remove truffle mixture from fridge and form into 12-14 balls, about 1 inch in diameter, placing them on wax paper. Return to the fridge for another 30 minutes to 1 hour of chilling. In a small bowl, melt white chocolate in the microwave (30 second intervals tends to work well). Carefully dip each ball in the melted chocolate, rolling to cover the exterior and allowing excess chocolate to drip off. Place balls on wax paper. Sprinkle with cinnamon to finish. Return to the refrigerator for storing.